Wisconsin's Lazarus A.D. do their part for the revival of thrash with an impressive debut. The Onslaught was originally self-released in 2007, then picked up by Metal Blade and re-released in 2009. Perhaps most resembling Anthrax at their most serious, Lazarus A.D. mix the basic elements of moderate to high speed thrash with beefed-up drumming to modernize the genre's sound, achieving a welcome robustness. Jeff Paulick's vocals are spit out with appropriate venom, and on guitars the tandem of Dan Gapen (lead) and Alex Lackner (rhythm) deliver controlled speed, energetic strumming and brief but not yet spectacular solos. Ryan Shutler's drum set establishes the foundation with a satisfying bass-heavy emphasis. The four strongest tracks are stacked at the front end of the CD, and they share a melodic death metal twinge and impressive structures. Last Breath kicks off with a staccato barrage followed by strafing drums that immediately establish the band's uncompromising intent. Thou Shall Not Fear is the crown jewel on the album, with an intro oozing confidence followed by a manic assault of unconstrained power. The final instrumental 90 seconds of the track are nothing short of brilliant, with the sudden drop in tempo pulled off with swagger. Absolute Power is more straightforward, the most traditional thrash track on the CD, anchored by a thoughtful riff. Revolution introduced clear melodic death metal tones to great effect, linking thrash's past with terrific future possibilities. 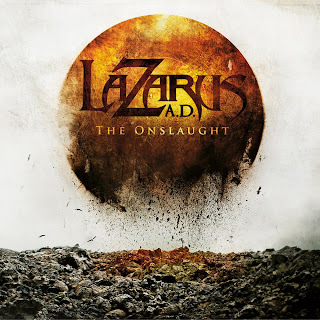 These four tracks are a bold statement of talent, Lazarus A.D. making a claim to be among the leaders not just in the re-emergence of thrash but within the contemporary metal movement in general. However, on the other six selections the band struggles to find a new perspective, The Onslaught's second half reduced to franticness in search of relevance. There are also some definite signs of amateurism here, not least when Every Word Unheard unforgivably fades away with the lyrics still being delivered. Despite the shortcomings, The Onslaught is packed with promise, a debut that helps to rejuvenate a classic genre and demands instant recognition. Recorded and Engineered by Chris Djuricic.